A huge chevron/pyramid-like object has been photographed over Taylor, Michigan and it looks like it is cloaked. Is it possible that a cloud formation could have been formed in this way or the photographer has captured a cloaked triangle UFO? 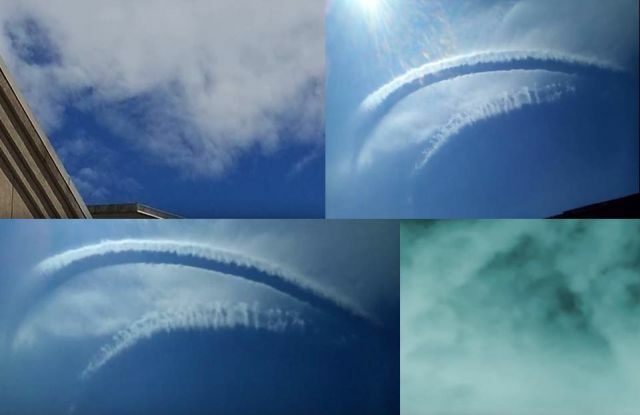 Another strange phenomenon has been filmed in the sky over Southern England on July 3, 2018. The witness has no idea what it could be, but it looks like a bridge or arch in the sky. It is striking that a layer of clouds apparently sits on top of something.